In order to understand Blinc mascara, you must begin by forgetting everything you know about mascara. Why? Because Blinc is not an oil-based paint like most mascaras. It is the world's original mascara formulation to form tiny "tubes" round your lashes that cannot smudge, run, clump or flake and require only water to remove. You apply Blinc just like a regular mascara. It is important that you do not use conditioners, lotions, etc... before applying the mascara. Blinc requires a dry, clean surface in order to adhere properly. When Blinc sets (about 2 minutes), it will form tiny water-resistant "tubes" around your lashes. The tubes will give your lashes volume and length. Unlike traditional mascaras, you do not let it set before applying another coat in order to build. Keep adding coats until you are satisfied with the volume, length and degree of lash separation before the mascara sets. Once it sets, you can no longer build. With Blinc, you will not have to re-apply mascara throughout the day. Whether your daily activities take you from the office, to your workout and then out to dinner, Blinc will look as good in the evening as it did when you first applied it in the morning. Did you know that most mascara sensitivities occur because of gradual flaking into the eye? Blinc's non-flaking properties make it ideal for active people, contact lens wearers, those with sensitive eyes, recent permanent makeup candidates and/or laser eye surgery patients...just to name a few. When it's time to remove, Blinc only requires a combination of lots of warm water and gentle pressure. Pressure alone is not enough, and water alone is not enough. You can cry at a wedding with the confidence that your mascara isn't running! That is why Brides magazine ranked Blinc mascara as one of the top 10 mascaras to wear on your wedding day! So...lots of warm water AND then gentle pressure, for example when taking a shower, will make the tiny tubes effortlessly slide off your lashes, without leaving any tint or residue behind. You will actually see the tiny tubes in your hand! Since nothing is left behind, there is no long term paint build-up or penetration, making Blinc healthier for your lashes. Also, because there is no need for harmful eye makeup removers, using Blinc is also healthier for your entire eye area since you will not be rubbing the most sensitive part of your face. Original tube concept, Volume adding, Length increasing, No flaking, No running, No clumping, No smudging, Tenacious hold, Rich texture, No skin penetration, No lash root buildup, No re-application required until removal, No makeup remover required, Thin container design which slows down impurity buildup in bottle, No tint or residue left behind upon removal, Less likely for eye irritation to occur, Less likely for eye infection to occur, Safer for contact lens wearers, Sunscreen ingredient protects your eyes from harmful UV rays, No compromise between look & hold & ease of removal, Specially designed brush for easy lash separation, Compact tube for easy travel, 6 color choices. The best mascara I've ever used! being blonde, getting my lashes covered from root to tip often meant over-brushing, this resulted in clumping and crumbling of the mascara causing irritation to my eyes!!!! Thank the heavens for Blinc!!! no clumps no irritation , great coverage!!!! I don't know how I survived without it!!! AMAZING! Today for the first time in my life I've been able to wear mascara without having itchy and bloodshot eyes. This is the best product available for sensitive eyes... I'm totally impressed. 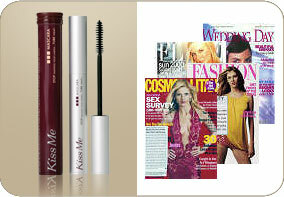 Kiss me mascara is brilliant for those disguised lashes that look and feel real without the spider eyes. the small wand end ensures you only apply what you need to make the look complete..
... Less is more ladies! Waterproof and doesn? ?t smudge or clog.. Brilliant! Not for me! There isnt much to my eyelashes so i need a mascara that builds them up and this doesnt do the job. I have to say it is a revolutionary product though and it will stay on forever! A good product but probably best for those with naturally long and thick lashes. I've spent a small fortune on mascara's and this is the best yet. The more you apply the longer and longer your lashes get. It doesn't smudge and is so easy to take off with just water. A definite in my shopping basket! FAB! As a professional Make-Up Artist, I found that when I used Kiss Me on my clients, they looked and felt gorge!! It's easy to apply, although it takes a while to dry, and it lasts until you wash it off...with water!! 3 hours, 8 hours, I've even had models keep it on for days, without smudging, flaking, or making the lashes drop. It's light and the long brush makes it easy to apply. It gives instant effect, and is a must for all groovy gals!